Re-posted in excerpt from The Millenium Report. The Millenium Report has been closely analyzing the San Bernardino shooting, their posts read as highly informative. This first one highlights a post sent in to them by Anonymous Patriots analyzing what is happening in the US today, please click over to read the full post. The second article highlights a Sott.net article which takes apart the official narrative of this young couple, Syed Farook and Tashfeen Malik, who had just recently had a baby (he had dropped off the 6-month-old girl with his mother that morning), suddenly becoming “home-grown violent extremists” and “radicalized in-place” to engage in mass slaughter. 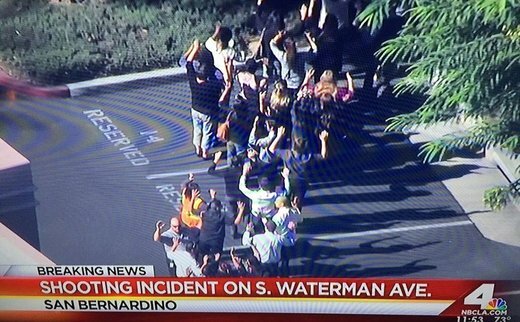 Was The San Bernardino ‘Mass Shooting’ A False Flag Within A False Flag? Excerpt: “The Millennium Report has been quite busy thinking about the many anomalies and inconsistencies throughout this inscrutable affair with no success in arriving at any reasonable conclusion(s). Then we were sent a highly credible and penetrating analysis by one of our readers. The following narrative delineating a “false flag within a false flag” makes so much sense it even passes the Occam’s Razor test. The armchair analyst who wrote this exposé deserves full credit for their sleuthing and cogent presentation. It’s clear that a high-powered intellect and extremely intuitive heart-mind figured this one out, if it is in fact the real plot. As a prep article for the excellent breakdown of San Bernardino posted below, the following link is offered as it provides both significant context and critical background info. The Anonymous Patriots are to be highly commended for their excellent contribution to the understanding of government-sponsored false flag operations. Caveat: A true American patriot would never kidnap a Muslim couple (ISIS-connected or otherwise) in the way suggested below. Only a faction under the control of the Zionist neocon cabal would conduct such a pre-emptive false flag operation. Homeland Security (the American SS), which is directly controlled by the Executive Branch is no longer a hidden secret government. It has come out of the shadows and is staging one false flag event after the next against the citizens of the U.S. Homeland Security controls FEMA and the ATF, two agencies that formerly conducted “black ops” activities within America. But on today’s geopolitical landscape, the all-out battle between international forces (aka the New World Order) and faithful American Patriots from a variety of law enforcement agencies is in plain view for all to see. Through “federal authority”, many patriots believe that every false flag terror event since 911 has been carefully designed, operated, and filmed by what is no less than the “Federal Homeland Security Motion Picture” production company. The evidence for two recent false flag terror events, Sandy Hook and San Bernardino, is so staggering that the poorly designed and executed plans were either created by idiots or the original plans were “upset” by insiders who commandeered the operation and turned it towards a different outcome. For instance, at Sandy Hook a “policeman” was apprehended in the forest adjacent to the Sandy Hook school (which according to state educational records had been closed for a year) on the day of the supposed shooting, just before the event. Over fifty vehicles responded to this first call of “the policeman in the woods”, even before the Sandy Hook false flag 911 calls were made. This policeman, who surely saw how the event was being staged, was apprehended and released; although, we know nothing more about him. Could this policeman be an example of a new breed of “patriot insiders” (Patriots) who knows about the machinations of false flag terror events staged by our own government in order to terrorize its citizenry? Do we again see possible evidence for patriot insiders foiling the intent of a government-sponsored false flag event in San Bernardino by creating a second false flag event on the same day that strategically moved the spotlight off of three white assailants who supposedly entered the Inland Regional Center to a husband-wife Muslim couple with a substantiated history of jihadist activity? Please continue reading at The Millenium Report: Was The San Bernardino ‘Mass Shooting’ A False Flag Within A False Flag? San Bernardino has proven to be a completely transparent false flag operation executed by rogue elements within the U.S. Federal Government. When the government routinely perpetrates such episodic schemes of savage violence against the citizenry, it needs to be dissolved. No entity under the sun has the legitimate right or lawful authority to arrogate power unto itself to harm or injure, paralyze or main, incapacitate or kill the people of this nation, especially when such reprehensible conduct is completely without cause. Not only are such actions by the state a serious breach of the social contract, they also represents a profound violation of the public trust. These incessant false flag shootings, therefore, break the inviolable bond between the citizenry and the government. In effect, the U.S. Federal Government has knowingly and willfully abandoned its primary responsibility to protect and safeguard the American citizenry. In so doing, and by persistently acting in a manner that is extremely hostile to the governed, those who currently govern these United States of America no longer constitute a legitimate government of the people, by the people and for the people. Another day, another massacre of innocents in the US of A. 14 people were shot to death during a mass shooting on December 2nd at the Inland Regional Center in the city of San Bernardino, California, about 100km east of Los Angeles. Another 21 people were wounded in what was the worst mass shooting since the Sandy Hook massacre in December 2012. At 11am local time last Wednesday, masked gunmen – initially reported as a team of three – “dressed head-to-toe in black tactical gear and vests stuffed with ammunition magazines”, entered one of the three main buildings on the site and made their way to the conference room, where staff for the county’s Department of Public Health were enjoying a Christmas office party. From the moment they opened fire, the shooting reportedly lasted 5-8 minutes, during which the gunmen “never said a word” and fired about 75 rounds into the group of unarmed civilians, with eyewitnesses saying they paused only to reload their weapons. The sight of heavily-armed police officers swarming the Regional Center was apparently so familiar to employees there that they initially thought they were witnessing “another active shooter drill“. This entry was posted in False flags, Gun Control, Homeland Security, Independence, Internet Freedom, Uncategorized and tagged false flag, San Bernardino, Syed Farook, Tashfeen Malik, The Millenium Report. Bookmark the permalink.